When your kids are sick and up coughing all night, it probably keeps you up worrying. You know you need to be very careful in selecting medicine for your kids, but is there an effective alternative to sugary cough syrups with alcohol? Yes there is: Herbs for Kids Cherry Bark Blend. This is a synergistic blend of throat soothing, cough-fighting herbs that reduces irritation and pain. The namesake of this non-prescription herbal supplement, cherry bark, helps by effectively turning down the part of the brain that sends the cough signal, letting your child's throat rest and recover from damage. Other herbs used are thyme leaf and Oregon Grape Root, which have antiseptic qualities that help fight respiratory infections and decrease inflammation. Mullein leaf helps treat sore throat, cough, and has even traditionally been used to treat asthma and lung diseases. Peppermint leaf includes menthol, the same ingredient used in many cough drops for its soothing, cooling effects. Horehound herb and Pleurisy root act as expectorants to help clear the throat and lungs. This powerful, safe formula also helps prevent dry, hacking coughs that often keep kids awake all night. As an added bonus, knowing how hard it can be to give kids medicine, Herbs for Kids Cherry Bark Blend comes in a taste that kids will love! 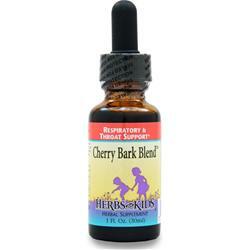 Cherry Bark Blend was designed to ease a dry, irritable cough. Cherry bark (Prunus sp.) and the other herbs in this formula synergistically create a powerful antispasmodic effect on the type of cough that keeps children awake at night. This type of cough is often associated with a dry throat, and repetitive, unproductive "hacking." Cherry bark temporarily calms the cough center in the brain, allowing the child to rest and the membranes of the throat to regenerate healthy, infection fighting surface mucus . It is a great alternative to cough syrups that contain dyes, sugars and alcohol.